Profile Design have acted as design consultants for the sister cafe’s of The Pavilion at Stansted park and Driftwood Cafe in Emsworth High Street. Two very distinct businesses, both extremely successful in their own right. The Pavilion is located in the restored Fig House of Stansted Park, positioned in the corner of the Walled Garden with the beautiful backdrop of the parks arboretum. In 2011 The Vine House and The Potting Shed were restored and cleverly linked to the Fig House, furnished with lovely Lloyd Loom tables and chairs. Profile Design have produced brochure designs, flyer design and print and gift voucher print as well as advertising and other promotional items. The Driftwood Cafe is located in the centre of the harbour village of Emsworth and is an extremely popular venue for morning coffee and lunches. 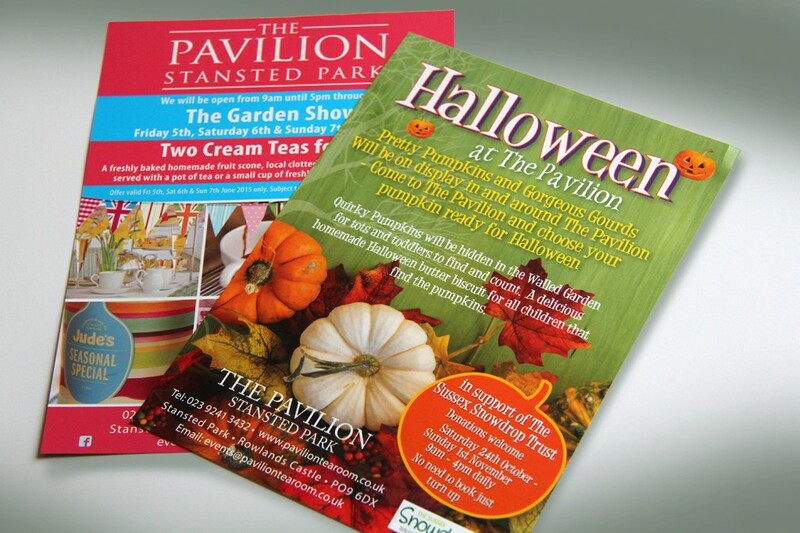 Profile have designed and produced printed promotional leaflets and flyers as well as press advertising and display posters.